A detailed history of the Civil War’s opening weeks, before the clash of armies began. Third in a trilogy on the war’s first 100 days, this volume by Detzer (Emeritus, History/Conn. State Univ.) 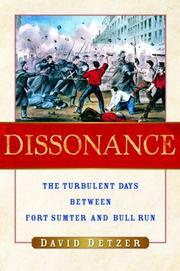 covers the period between Allegiance (2001) and Donnybrook (2004): “a critical time,” the author writes, “when America’s two sections stumbled noisily into war.” The primary focus is on Washington and its vicinity, although the author discusses events in Philadelphia, New York and other areas as they relate to the main story. A pressing issue after the firing on Fort Sumter was whether Maryland, a slave state, would remain in the Union or cast its lot with the Confederacy. Virginia’s decision to secede confronted Lincoln and Winfield Scott, the senior U.S. general, with the prospect of an enemy close enough to bombard the White House from its own territory. If secessionists prevailed in Maryland, the nation’s capital would find itself surrounded by hostile territory. When Federal troops from Massachusetts and Pennsylvania were attacked by rioters while changing trains in Baltimore, Washington’s link to the rest of the Union appeared fragile. Detzer details the political forces at work on both sides, the logistical problems of raising armies in a nation with a tiny military establishment and Virginia’s early successes at the Harper’s Ferry arsenal and at Gosport, the key naval installation at the mouth of Chesapeake Bay. He critically analyzes the persistent legend that Lee, then a mere colonel, was offered command of the Union forces before casting his lot with his native state. He examines the Confederate campaign to win recognition from England and France, on which the would-be nation pinned its hopes as much as on military action. He also draws effectively on contemporary documents, including personal diaries, to show the reaction of ordinary people to the previously unthinkable prospect of civil war. A solid account for the non-specialist audience.